The silver iodide produced by the burning chambers will provide the particles required to form rain. Radar data showed that a gentle breeze could carry the cloud-seeding particles more than 1,000 metres above the mountain peaks, according to the researcher. A single chamber can form a strip of thick clouds stretching across more than 5km. The technology was initially developed as part of the Chinese military’s weather modification programme. Efforts to employ the defence technology for civilian use began over a decade ago, the researcher said. One of the biggest challenges the rainmakers faced was finding a way to keep the chambers operating in one of the world’s most remote and hostile environments. “In our early trials, the flame often extinguished midway [because of the lack of oxygen in the area],” the researcher said. But now, after several improvements to the design, the chambers should be able to operate in a near-vacuum for months, or even years, without requiring maintenance. Communications and other electronic equipment is powered by solar energy and the chambers can be operated by a smart phone app thousands of kilometres away for through the satellite forecasting system. The chambers have one clear advantage over other cloud-seeding methods such as using planes, cannons and drones to blast silver iodide into the atmosphere. “Other methods requires the establishment of a no-fly zone. This can be time-consuming and troublesome in any country, especially China,” the researcher said. This month, the China Aerospace Science and Technology Corporation signed an agreement with Tsinghua University and Qinghai province to set up a large-scale weather modification system on the Tibetan plateau. In 2016 researchers from Tsinghua, China’s leading research university, first proposed a project – named Tianhe or Sky River – to increase the water supply in China’s arid northern regions by manipulating the climate. The project aims to intercept the water vapour carried by the Indian monsoon over the Tibetan plateau and redistribute it in the northern regions to increase the water supply there by five to 10 billion cubic metres a year. Climate simulations show that the Tibetan plateau is likely to experience a severe drought over the coming decades as natural rainfall fails to replenish the water lost as a result of rising temperatures. “The satellite network and weather modification measures are to make preparations for the worst-case scenario,” the Tsinghua researcher said. The exact scale and launch date for the programme has not been fixed as it is pending final approval from the central government, he said. 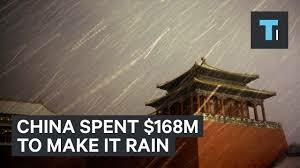 Beijing might not give the green light for the project either, he added, as intercepting the moisture in the skies over Tibet could have a knock-on effect and reduce rainfall in other Chinese regions.